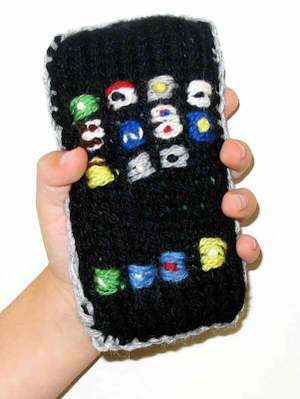 DETROIT, MICHIGAN - One hundred fourth grade inner city youth from Detroit, Michigan on Saturday received their very own hand-knit iPhone from The Detroit Technology Foundation in an effort to offer disenfranchised youth hope for the future. Foundation Director Michael Hypemaker said; "We wanted the kids to experience what it would be like to recieve brand new technology, especially when it's the hottest new mobile device on the planet. 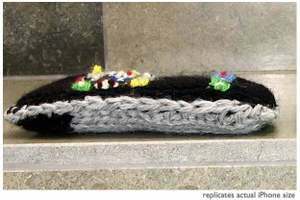 These kids can put their hand-knit Jesus Phone under their pillows at night and dream of some day owning one for themselves, dreaming is half the fun of being a kid", laughed Hypemaker. Mr. Hypemaker indicated that he was personally moved by how pensive the children were when opening their gifts. "I expected more excitement and cheering from the kids, but it was still great to see those tears of joy when the hand-knit iPhones were finally removed from their boxes", said Hypemaker, "I knew we did the right thing." 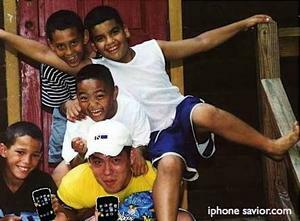 He expressed his exuberance by saying; "Sometimes almost getting an iPhone is better than getting none at all." The foundation chose to deliver the pseudo iPhones in authentic Apple packaging left over from the real iPhones that Hypemaker recently gifted to his largest contributors, minus the one device he chose to keep for himself. It was a bonus for the kids that the hand-knit iPhone does not require a specific carrier, activation or a monthly calling plan. Communicating from phone-to-phone was playfully simulated by some of the more enthusiastic kids using cups and string.